When I sort through my stash of cards, it's easy for me to find feminine looking cards but I always run into trouble when I need something masculine. I didn't realize how often I made cards with flowers! Today's card uses a stamp I have had for years - probably at least 7 years. It's not from Stampin' Up! but rather PSX. I love the detail on this image. This card is going to my son and he loves to golf so it was an easy choice. I kept the embellishments to a minimum knowing the post office will charge me an arm and a leg if the card is more than 1/4" thick. In fact, I may already have a problem with the button I used, but I felt it really needed something. The button is from the Stampin' Up! Sherbet designer button pack which has a really nice variety of styles and sizes. If you look closely, the center of the button is not tied with thread or ribbon, but rather a thin piece of chocolate paper. It adds an unexpected element to the card. It's a beautiful day today in Central Florida. I'm off to do my 3-mile walk with my friend and neighbor. Be sure to stop by tomorrow so I can show you the awesome surprise my husband gave me over the weekend! Supplies: Stamps: Sincere Salutations, golf bag (PSX); Ink: Black, Chocolate Chip, Copic markers; Paper: Very Vanilla, Kraft, Chocolate Chip, Pumpkin Pie and Welcome Neighbor DSP; Accessories: Button, Big Shot Texture plate SU Backgrounds 1, Chocolate double-stitched grosgrain ribbon. Yeah Baby! It's Spring Break in Orlando!! Tourists are everywhere and I mean everywhere! Every other car on the road has an out-of-state license plate and has what seems to be at least two college-aged kids in it. If the car isn't full of college students, it usually consists of your typical, everyday, garden-variety family of 4 with "Dad" at the wheel. "Dad" is often the frenetic driver bobbing and weaving from lane to lane trying to read the signs for the Disney theme parks and frustrated at the number of toll roads leading to them (By the way, we thank you for your generous donations to the maintenance of our highway system). Oh, to be a tourist in Central Florida during Spring Break! On behalf of THE Mouse and myself, we welcome all of those fabulous, revenue-generating tourists to to the happiest place on Earth! The main image of this card isn't Stampin' Up!, it's made by Magenta. I've had this stamp for about a year and this is my first time using it (sad, but true). I thought today would be perfect to do something with it with all the kids out of school for Spring Break. These images depict what a perfect Spring Break should consist of. I used my Stampin' Write markers and Aquapainters on watercolor paper for the images. The white embossed background is the new Swiss Dots Cuttlebug embossing folder. Various Stampin' Up! cardstock, brads and ribbon finish it off. 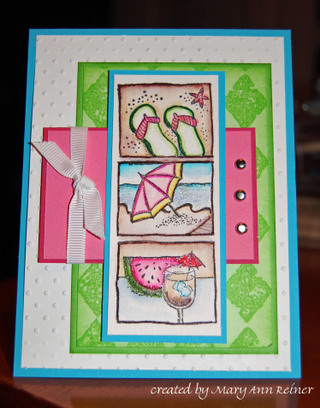 This sketch is a mild adaptation of the sketch challenge on Splitcoaststampers (sketch challenge 169 ). I didn't follow it "exactly" but it certainly served at a nice guideline. These sketches, and others like them, are just what I need when I'm not feelin' the stampin' love.